4. Choose Construct > Go to Position… . This will bring up Figure 2.89. 5. Enter the range of nucleotides as shown: “86-1276” [NOTE: this range represents the sample region corresponding to the tetracycline resistance gene]. You can also go to a specific single position (not a range). 6. Press Go to . 7. The program should have highlighted the range of nucleotides as in Figure 2.90. 8. You can now format the highlighted segment (change color, font, size, style, etc.) or make a protein region to represent the tetracycline resistance gene by selecting the menu option Construct > Features > Make Region… and entering the details of the selected region.The Go to Position feature enables users to quickly jump to specific sequence positions or sequence ranges that represent known features in a sequence file. You can also enter a range of nucleotides that span the origin of circular constructs (e.g. 4181-56) which will then be subsequently highlighted. 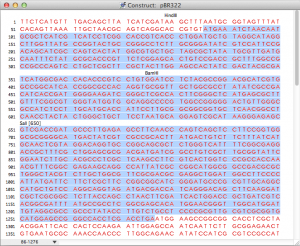 This entry was posted in gene construction kit tutorials and tagged Find Positions, Go to Position in Sequence. Bookmark the permalink. Trackbacks are closed, but you can post a comment.